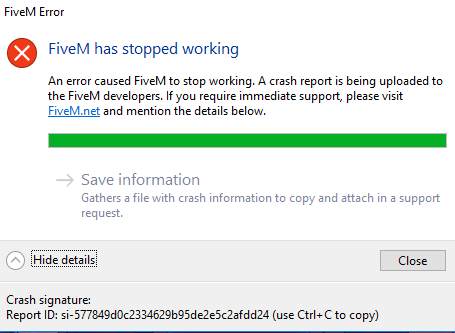 FiveM Crashes on startup Help! To receive support, please fill out the following template, and remove this top text. Did you try to disable/uninstall your Anti-virus? Also add what you already tried so far. need all of this info. hi flames after having this problem i now no what the problem is. your pc is unable to open fivem in the normal Graphics mode .I.E ful screen with adavanced graphics because your pc cant handle it. THE FIX FOR THIS IS OPEN FIVEM/GTA5 IN SAFE MODE/WINDOWED MODE. putting it on the lowest possible settings.